With the recent passing of Mbah Gotho of Indonesia, who died at the age of 146 exactly 146 days before the Revelation 12 Sign, the title of "world's oldest man" now passes to Yisrael Kristal of Haifa, Israel. "Yisrael" is the Hebrew pronunciation of "Israel" and "Kristal" means "crystal". However, according to Ancestry.com the name "Kristal" is also an adjectival form of "Christ" in some European languages. Kristal will be 120 years old in 2024, the year that may speculatively see the conclusion of the Tribulation and the return of Jesus Christ to Israel. As a matter of fact, according to TorahCalendar.com Kristal will be 120 all the way until the Day of Atonement, the traditional date for Christ's return, not turning 121 until the next day. Then the LORD said, "My Spirit will not contend with humans forever, for they are mortal; their days will be a hundred and twenty years." Matthew 24:37 says that the return of Christ will be "as it was in the days of Noah", so we can expect to see some parallels between the two times. Interestingly, Kristal has been married twice, the second marriage occurred in 1947, which was the year that the land of Israel was apportioned by the nations and a U.N. resolution declared a Jewish state in the Holy Land. His second wife's name was Batsheva, which is the Jewish pronunciation for the biblical character Bathsheba. Bathsheba means "daughter of oath". Jerusalem is figuratively called a daughter in the Bible (the daughter of Zion) and an oath was made in November 1947, setting aside a Jewish state. Bathsheba was also the mother of Solomon who was the last king of the united kingdom of Israel and it was Solomon who built the Temple. God will not contend with mortal man forever. Judgment will come in 120 years. God is regathering his people and though He was divorced from Israel for a time, He will remarry her. Her Temple will soon be rebuilt and the last king will soon come. The times of the Gentiles are over. In 2017 His focus returns to Israel. In 2024 Christ (Kristal) might return to Israel (Yisrael) at the culmination of judgment. Yes, I'm seeing more and more of these things, but, we'll, not so surprising anymore. I am confused, his birthday is 1903, how can he be 146 years old? "who died at the age of 146"
Mbah Gotho (the first person mentioned) was 146 years old and died a number of weeks ago. He was born in the 1870s. Yisrael Kristal was born in 1903. They are two different people. NONSENSE, 146 years old. That is an impossibility. Can you be that naive to believe that? I see 120 or at the MOST. And Pipsqueak Kushner is NOT the Man of Sin. Give me a break. I have a sneaking feeling that 'he' will come from above, imitating the true 2nd coming. Hello Gary, this article is coming to be fulfilled as Yisrael Kristal death at the age of 113, implies the beginning of 2017 flood as in the days of Noah.. remember Methuselah the oldest man on earth who died and set forth the flood as God's appointed time. 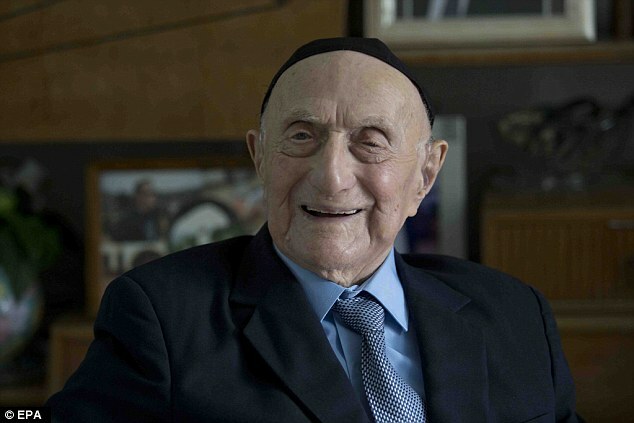 Yisrael Kristal lived for 113 years and 330 days. Which in greek strong's number 113, 330 means "lawless revive". Yisrael commented in his lifetime (when interviewed) that his GOD keep him alive everyday even during holocaust, his companions died after eating the same food as him but GOD kept him alive, and he believed that his day to died will also be appointed by YHWH. Just as Methuselah is appointed to die at 969 being the world oldest man then, Yisrael Kristral lived to died at this year to tell of the flood year. In one interview last year when he celebrated his bar mitzvah, Yisrael spoke seriously at one juncture: "look at this man, see how many people he brought to life", though speaking of himself, he is also pointing to the one who was and who is to come!